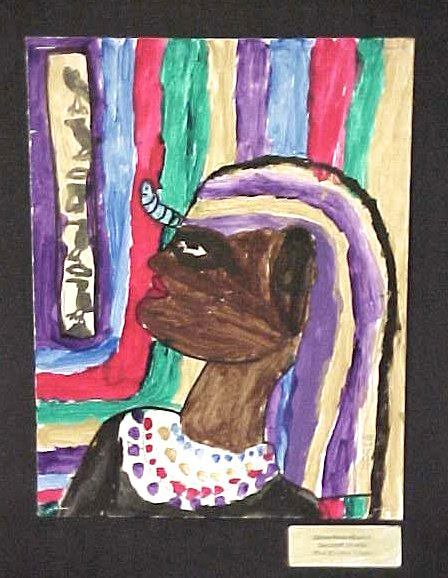 Create portraits in the style of the Egyptians. Use correct proportion in drawing the facial features. 1. Introduce the art and culture of Egypt. Read about Egypt and locate on a map or globe. Discuss tomb painting and hieroglyphs. Show examples of each from handouts. 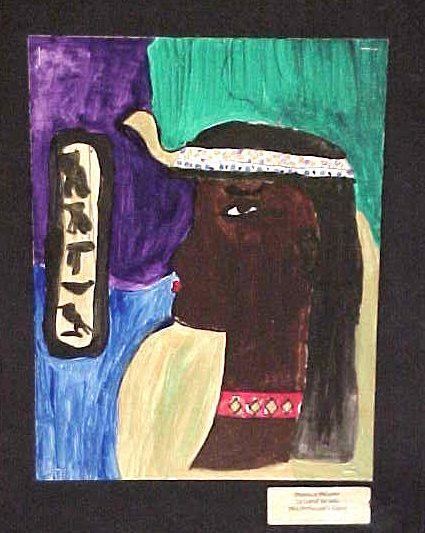 Tell students we will be creating a self-portrait in the style of the Egyptians, like they might have painted on a wall of a tomb. 2. Discuss and demonstrate the correct proportion of the human face. Explain that we will do a profile (side view) for our portrait, but that the eye was drawn as if it were a front view. Demonstrate how to do this using a student model. 3. Students will work on 8 ½ x 11" (21.5 x 28 cm) paper to draw side views of the people at their table. The head should take up most of the page with very little background left empty. When they have their best one, transfer it to the mat board by rubbing pencil over the back and then re-tracing it. It may take a couple of periods to get their best one finished. 1. Review information on Egypt. Go over how the Egyptians adorned their heads with wigs and crowns. Show examples in books. 2. Students will add adornments and wigs to their portrait. 3. Any other details may be added at this time. 1. Complete any touch-ups that need to be done. Trace over all lines with Sharpie marker. 2. Teacher will demonstrate painting with Acrylic Paint . Show how to add a drop or two of water to make the paint go on more smoothly. Demonstrate how to layer colors (let first layer dry before adding anything extra). Students will paint their portraits. The Egyptians traditionally used brown or beige for the face, and gold, adorned with small amounts of red, blue and green, for the crowns, headwear, etc. 1. Discuss the Egyptian's alphabet, called Hieroglyphs. Demonstrate writing a name using these symbols in a vertical format, like a cartouche. Students will write their name in hieroglyphs on a 1" wide strip of scratch paper. When they have it how they want it (some of those symbols are tricky!) they can transfer it using the graphite method. Outline this with black marker. 2. Continue painting the project. 1. Continue painting until "no white paper shows." My students are used to hearing this and know that it means to paint everything, even the background. I don't put out the gold acrylic until this day, because I want them to concentrate on the face for the first couple of days. 2. As a follow-up, we view the video of Mummies Made in Egypt, which is a Reading Rainbow of Aliki's book. We then go on to making Egyptian mummies and sarcophagi out of clay.